Moto G5 Plus with 4GB RAM, 32GB storage now priced at Rs. 14,999 - AndroGuider | One Stop For The Techy You! 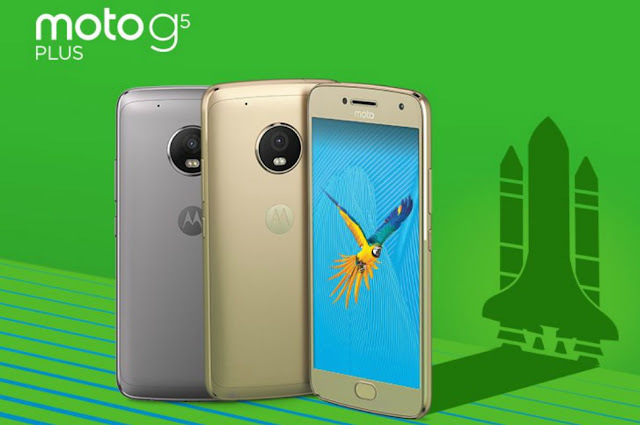 Following the launch of Moto G5S & G5S Plus, Motorola has announced a permanent price drop on the Moto G5 Plus. The 4GB RAM and 32GB storage variant of Moto G5 Plus that was launched at Rs. 16,999, will now be available for Rs. 14,999. The price change is yet to be reflected on Amazon India and Flipkart. There's no information about the 3GB RAM and 16GB storage version, which is also priced at Rs. 14,999. To recall the specs, the Moto G5 Plus features 5.5-inch Full HD IPS display with Gorilla Glass 3, octa-core Snapdragon 625 Mobile Platform, 12MP f/1.7 rear camera with dual autofocus pixels, 5MP f/2.2 front camera, fingerprint scanner, 4G VoLTE, dual-SIM slots and 3000mAh battery. It runs Android Nougat out of the box. However it is better to pay Rs. 1,000 extra and grab the Moto G5S Plus for Rs. 15,999. That extra Rs. 1,000 you'll be paying for a bigger 5.5-inch Full HD display, dual-cameras and 64GB storage, when compared to Moto G5 Plus. Or you can wait for Xiaomi's upcoming dual-camera toting Mi 5X, which is expected to launch on September 5. Interestingly, it offers the same specs as the Moto G5S Plus, and expected to priced around Rs. 15,000.